UPDATED: HP's website also briefly listed the TouchPad, HP Veer and the Pre 3 as S, M and L sizes of webOS. So these devices are obviously going up for sale pretty soon after today's announcement. Oh, the information age we live in! Not only devices leak straight from factories or absent-minded employees these days, but also an hour before there much-hyped presentation. PreCentral managed to get behind the curtain of the preparations for HP/Palm "Think Beyond event", and got the info about a 1.5 pound 10" tablet with 0.51" thickness, which is to be called the HP TouchPad, and was known as the Topaz before. The 10-incher had some really tiny phone to keep it company, which is really intriguing. That is probably the low-end teen phone, which was named Castle. The webOS munchkin is supposed to appear on Verizon, Sprint and AT&T as a Palm Pre version for the younger crowd, but is lacking a physical keyboard. Other than that, these specs coincide with what was leaked before, so most of it will probably turn out true today - dual-core 1.2GHz Snapdragon chipset with up to 8 hours of battery life. We'll know very soon, stay tuned for our coverage of the HP and Palm event. Finally some great news for webOS fans. 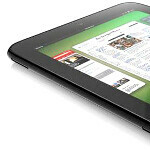 I think WebOs will be better on the tablets than it is on the limited hardware for the phones that have it now.